This small, and now comparatively old, 35mm SLR camera was a popular body for me back in my film days as I it came with a great 50mm prime lens. It was produced from 1981 to 1984 but I got mine used for super cheap in the late 1990s. I got mine with the 50mm lens, a long zoom, a pile of filters for black and white photography, and a camera case all for $25. Meter: Yes, TTL for aperture priority metering. Shutter Speeds: Meter (1s to 1/100th), 1/100 (for flash), and Bulb. Focus: Manual only, uses a split image and a microprism ring which is very easy to use. Hot Shoe: Yes, this will work with an on-camera flash or even fire your studio strobes with a hot-shoe trigger. Power Source: Two SR-44 (hearing aid type) batteries. Other Goodies: A self timer. Winder Compatible: Yes. 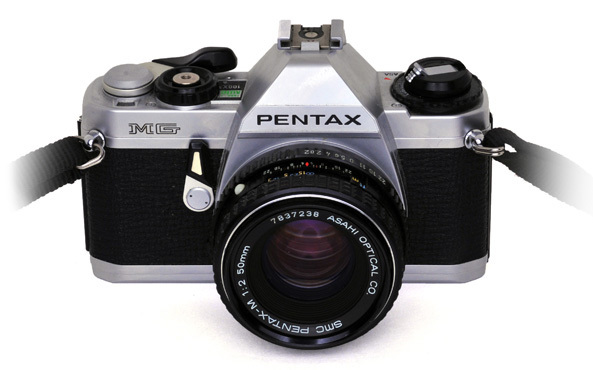 This camera works with the other M-Family of Pentax camera bodies for winders and adapters. Use the Winder ME to achieve 1.5 frames per second or the later Winder ME II for 2 frames per second. You would set the aperture on the lens itself. This movement of the aperture ring told the camera how many stops less/more the light would be and it would show you the shutter speed on the right. These speeds were shown with colors (red, yellow, and green) to indicate possible under/over exposure as well as possibility of blur from handshake. Although the Pentax K1000 was considered to be THE student camera for years, this body takes the same lenses and is also a good body for learning basic photography. Both Pentax bodies are readily available on eBay, but with the K1000 having more sentimental attachment and more manual control options, it fetches more money. If you've got some old Pentax K or M lenses laying around and just want a cheap body that will work well with them, then the Pentax MG is a fine choice as well.